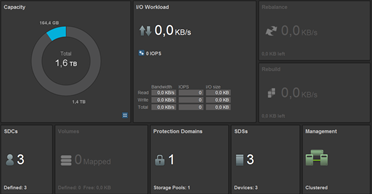 In the first part we prepared our environment for the ScaleIO installation. I immediately warn that the procedure of disc drives preparation to work as VMDK is very time-consuming. If we have in each server several large disks (the more the better) in the beginning we can choose the one disk per server. This will speed up the installation, which is of great importance if errors occur and we will have to undo the changes. 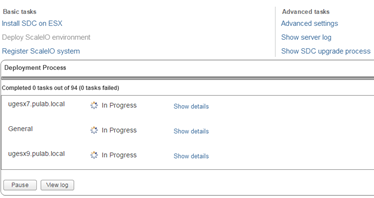 At a later date, if all goes well, add the remaining disks. 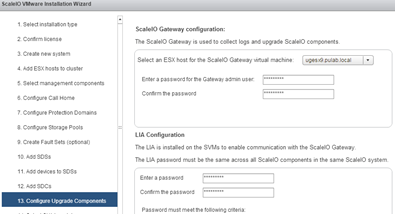 It is worth considering the structure of the whole, ScaleIO roughly corresponds to the one known in the disk array. 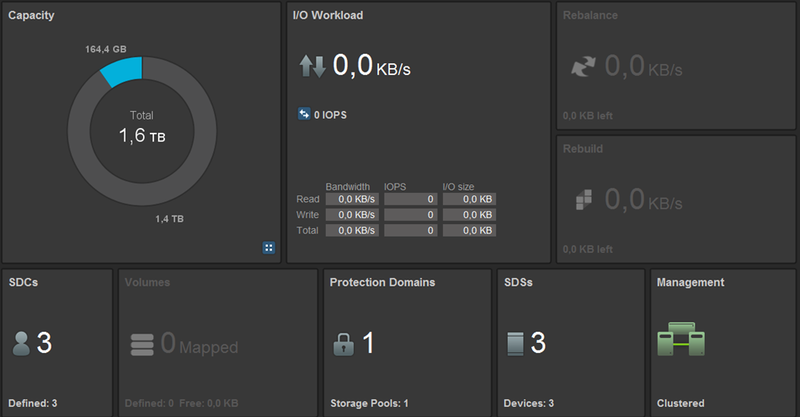 So we have a disk pools to which we assign a specific drives (you do not need to have everything in one pool). Besides, in a similar way ESXi “sees” ScaleIO, SDC component presents itself as HBA (FC). 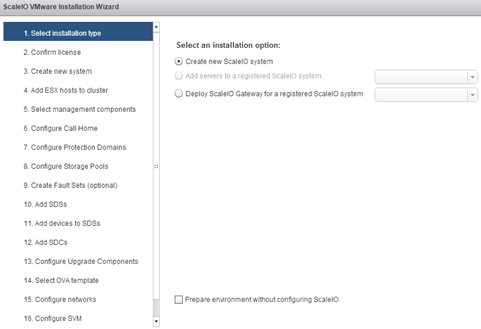 We begin by running the “Deploy ScaleIO Environment” option and go through all the configuration screens. It is the first installation, so choose the option “Create new ScaleIO system”. 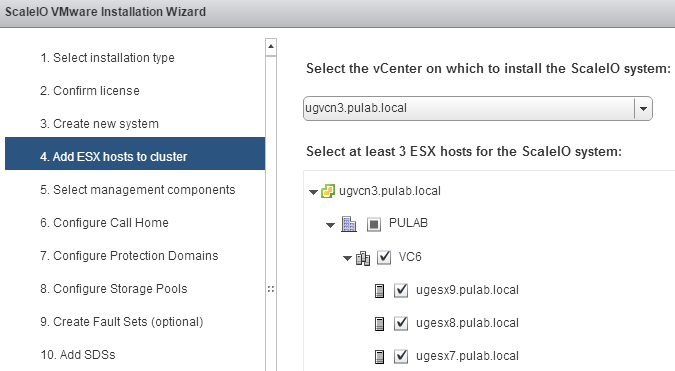 We can also select (at the discretion) to “prepare environment without configure”, this will significantly shorten the time needed to initiate the environment but all configuration settings and so we will have to do later. I suggest for the first time to perform the full procedure. 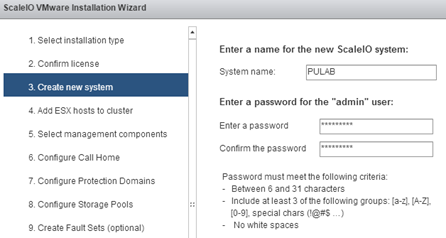 We configure our first “Protection Domain”. As you can see, at this stage we set the size of the cache in RAM which will use each of SDS. This value can be changed at a later date. 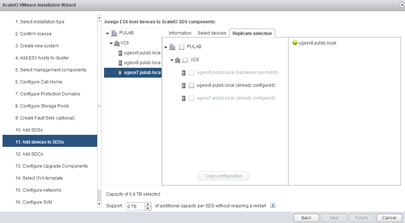 On this screen you can select which hosts install ScaleIO Data Server (choose course all the ESXi). 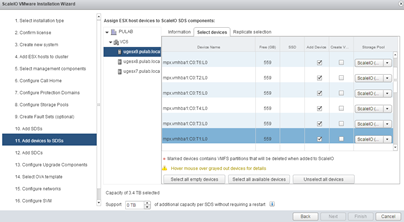 If you have identical hosts in terms of hardware configuration, you can copy the configuration screen (ie, marked discs) on the other hosts. 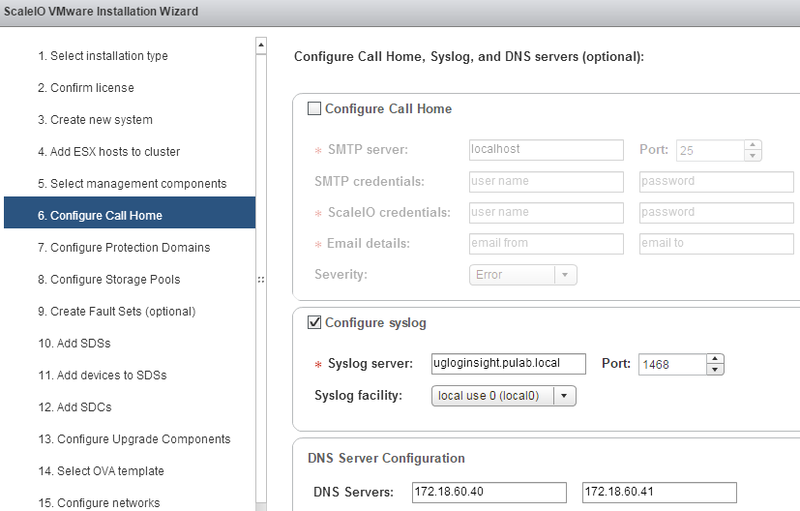 This screen might suggest reinstalling the SDC but it is not, on selected hosts SDC is configured (for communication with MDM). These settings can be checked on each ESXi before and after installation ScaleIO (command: cat /etc/vmware/esx.conf | grep scini). 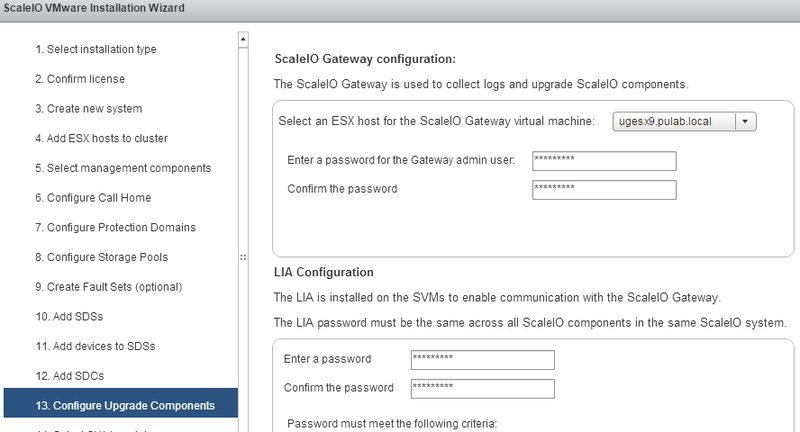 On this screen, select on which ESXi will be installed ScaleIO Gateway, and define a password using the IM logs on to the MDM. On the last screen we define the IP addresses. Here a very important piece of information, documentation misleading and saying to the network management must be added VMkernel. 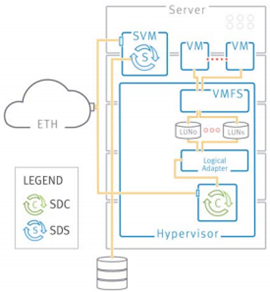 In fact, to the two networks must be added VMkernel (ie Management and Data network). 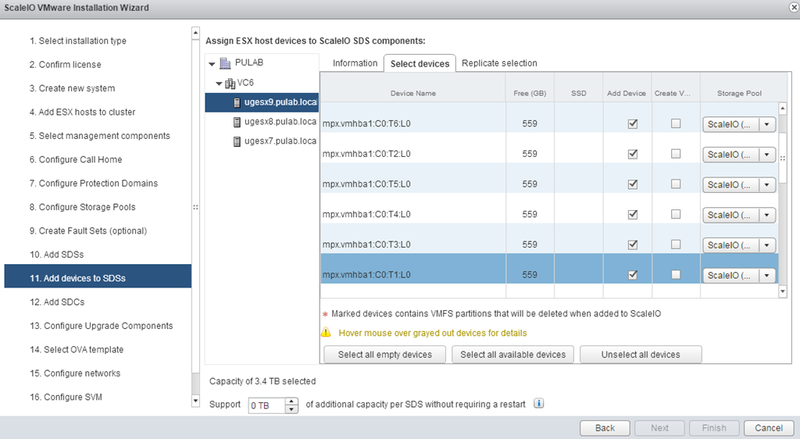 Without VMkernel on data network configuration of the SDC has been executed incorrectly (!!!). Run the installation process and wait. The installation includes initializing disks (eager zeroed), so it may take a very long time. 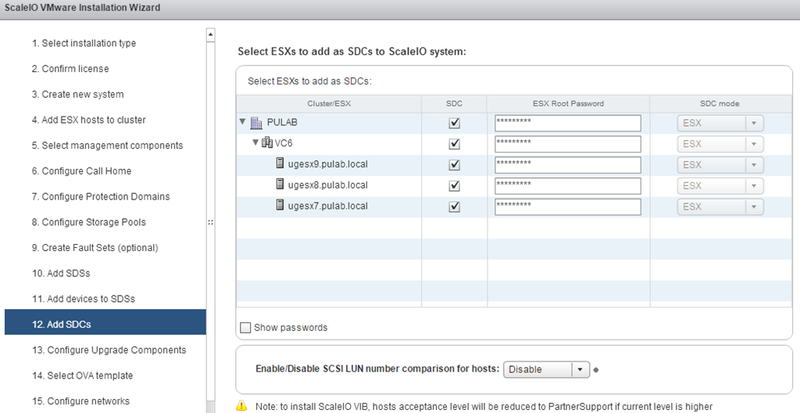 In the next part we will configure ScaleIO, which will prepare the first volumes and export them to ESXi (and more). Actually, VMkernel is not needed for the Management network, unless you’re using a single-network option (management + data on the same portgroup). 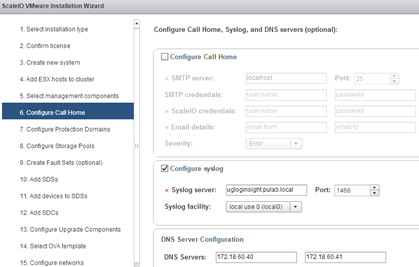 Management network is only used for accessing SVMs. Control and Replication traffic go through Data network. 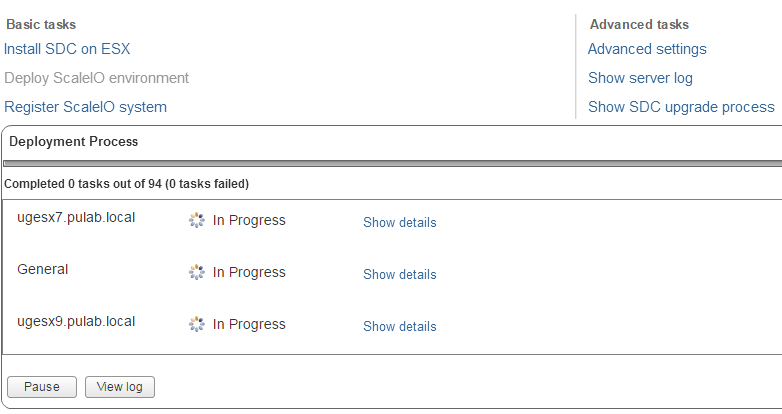 Documentation and deployment wizard are both misleading.